Hey everybody, so it’s my birthday and–besides being old enough to, here in America, indulge in alcohol–something I thought would be a little fun would be to share something cool: how many other people share my birthday. Jonathan Swift–churchman and satirist, author of, most famously, Gulliver’s Travels and A Modest Proposal. Winston Churchill–yeah, that one; “We shall fight them on the beaches,” etc. etc. There’s way more on Wikipedia, but these jumped out to me. This was fun! Okay, so it’s been several hours and I finally have my thoughts in order on “The Day of the Doctor,” which, unless you’ve been living under a rock for the past week, is the 50th Anniversary special of the longest-running science fiction television series in history, Doctor Who. I’ve been excited just as much as anyone else for this. In my excitement, I’ve been watching videos about the classic series, browsing the official wiki, the TARDIS Data Core, and started listening to the Eighth Doctor audio dramas that have been produced since 2001. 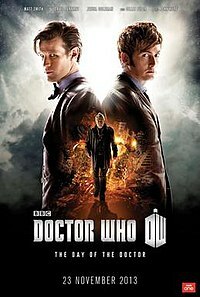 What helped the series get off the ground when it relaunched in 2005 is that it established the Doctor as the last of his kind, after he was forced, during the Last Great Time War between his people, the Time Lords, and their arch-enemies, the Daleks, to take out both sides, as we’ve seen in previous seasons. The War Doctor, it turns out, was the incarnation that actually accomplished this horrific task. So yeah, long story short, the War Doctor was a choice the Doctor made. He succeeded in his goals, but his actions were so dark that the Doctor subsequently chose to forget that incarnation’s entire existence. Yowza. So what’s the story of the special itself? Well, the current Doctor, the eleventh (Matt Smith) and companion Clara Oswald (Jenna Coleman) are hanging around in Shoreditch, London where Clara is now a teacher at Coal Hill School (the same school shown in the very first episode of the series, where the Doctor’s granddaughter Susan was a student). However, they’re interrupted by the TARDIS being airlifted by helicopter to the National Gallery, where UNIT (basically, the WHoniverse answer to SHIELD) troops led by Kate Stewart (Jemma Redgrave), daughter of the Doctor’s old boss, Brigadier-General Lethbridge Stewart, is waiting for them. The Doctor is shown preserved instructions from Queen Elizabeth I and a 3-D painting of the last day of the Time War and other 3-D paintings; their glass has all been broken and the figures inside the old paintings have disappeared. The machine actually is meant to detect the alien race known as the Zygons, who are shape-shifters; the Doctor accuses Elizabeth of being one, but it turns out…it’s her horse! Meanwhile, on Gallifrey, the War Doctor has stolen a device from the Time Lords: a sentient, galaxy-destroying weapon called the Moment. He has the intention of using it to wipe out both the Time Lords and the Daleks to prevent any further destruction, but the Moment’s conscience appears to him in the form of the Tenth Doctor’s love interest, Rose Tyler (Billie Piper) and implores him to find another way. This was a remarkable episode, both in its existence (again, longest-running sci-fi show in HISTORY) and the way it was broadcast (it was simulcast around the globe at the exact same moment in 75 countries). But at its heart, this was a terrific story. The second David Tennant appeared on screen as the Doctor for the first time in five years, it was like he had never left. As usual, he was brilliant and it felt like showrunner and episode writer Steven Moffat felt rejuvenated just using this specific incarnation again. Matt Smith, whose tenure as the Eleventh Doctor has been really uneven and dark, especially the back-half of this past season, was in fine form. He turned down his manicness and really drove home the point that yes, this is an alien who is over 1,000 years old we’re rooting for here.Hurt had a difficult task in front of him, but he pulled it off, giving us a Doctor consumed by anguish from years of war and the thought that he had to make an impossible choice.For their part, Jenna Coleman and Billie Piper were terrific. Coleman made Clara just as plucky as she’s always been and Piper, although not exactly playing who I was expecting, was great and subdued, giving what could have been a filler part wonderful depth. As I said, Moffat’s script was dynamite, proving that–however odious his many faults are–he does have a lot of talent and it was on display here. This honestly might be his best work on Who, period, since the immortal episode “Blink.” He offered two big surprises–that I’m not spoiling–that not only changed the nature of his own run on the show but the entire legacy of the show itself. It was great. Director Nick Hurran, who I’ve never heard of in connection with this show before, gave this the greatness it needed, keeping people on the edge of their seats the whole time. Overall, this was a stellar episode, a stellar tribute and a great big birthday card for one of television’s best shows. So I’ve learned over the past couple years that I am an absolute sucker for the J.J. Abrams aesthetic, particularly when it comes to science fiction. I adore Fringe and, although I didn’t write about it, Super 8 was one of my favorite movies of its year. And of course, if I hadn’t seen his Star Trek, a big integral part of this blog might have never gotten off the ground. You may surmise, then, that I was thrilled to see a new TV SF series from Abrams’ Bad Robot company and produced by him and Fringe contributor J.H. Wyman, who created the show, Almost Human, was to premiere on Fox, which it did this past Sunday and Monday. Karl Urban, the new McCoy, even stars in it! How awesome could this be? Well, as it turns out, plenty awesome. Almost Human manages to, I think, get back to the “lived-in” SF aesthetic present in the original Star Wars while still managing to feel very real and of-the-now. So what’s the story? Well, it’s the year 2048 and while technology has moved forward by leaps and bounds, the rate of change is now so fast as to be almost unregulated; thus, criminals are constantly coming up with new tech to confound the cops. Luckily, the police have android officers around to help them. Det. John Kennex (Urban) and his partner are leading a raid on a crime syndicate when they’re ambushed and his partner is shot to pieces. Kennex, angry that an android refuses to help, saying the man is doomed, attempts dragging him out himself, only to have his leg blown off and himself knocked out. We cut to two years later, where Kennex, out of a coma and with a robotic leg, returns to active duty. He’s paired with the now-standard MX-model android, but when it proves too coldly robotic, he disagrees with it–by pushing it out of a moving car. Needing something a bit more suited to him, he’s gifted by technician Rudy (Mackenzie Crook) with Dorian (Michael Ealy), an antique DRN model that was deactivated four years ago due to his make being invested with a “synthetic soul”–programming to help them intuit and emote, thus making them better at their jobs–that made them unstable; however, Rudy believes it’s suited perfectly for Kennex because they’re alike. “You’re both a little outdated,” he says. After some misunderstandings, the two set out to deal with the same syndicate that killed Kennex’s partner as well as take down any criminals they’re assigned against. So does this concept of heady SF premise + procedural cop show work? Yeah, quite well. To begin with, like I said, the future is sleek, but not too sleek; we have robots, but everyone still drives regular cars. Not a jetpack in sight. Such thinking helps ground the show’s Detroit environment and enables us to pick up on any parallels to the present day that might be made. And oh boy, do we have some. We’ve got the very partnership of the title as well as Dorian helping Kennex overcome his hatred of androids standing in, on some level, anyway, for race relations; we have sexbots show up to take the place of human prostitiution and I’m sure there’s more to come. Like other cop shows, this wouldn’t work if there wasn’t chemistry between our duo and Urban and Ealy have it in spades. Ealy, as some have noted, is definitely the star, getting all the best lines and having the most interesting angles to play. But that’s the nature of robots: they might not be fully three-dimensional but they’re meaty parts. It’s made easier by the fact that Dorian has a synthetic soul, thus his emoting is natural and believable within the context of the story. Urban is great, too, making a perfect verbal sparring partner. Kennex is a bit rote as the grizzled cop veteran, I suppose, but as someone who doesn’t watch cop shows normally, I didn’t really get that vibe. He’s a great presence to pin this show around and it looks like he can pull it off. Crook–known now and forever as Gareth on the original British Office and Ragetti, the guy with one glass eye from the Pirates of the Caribbean franchise–hasn’t gotten a lot of screentime so far, but he owns every minute he gets. He’s a wonderful comedic presence and is easily the best coroner character I’ve ever seen on this sort of show. Overall, this is a great show and one of the success stories of the fall season. Check it out now on Hulu or on Fox’s website. You’ll be glad you did. Sorry everybody but I’ll not be updating this week as I’m staring down some massive deadlines at school. I’ll link to some cool stuff to fill this space soon but now I’ve got to go to bed. It’s time for Star Trek Saturdays #32! This week’s episode is “Who Mourns for Adonais?” and it’s an episode that, despite some misogynistic undercurrents, manages to bring forth the humanism that’s at the heart of the franchise. We open with the Enterprise in the Pollux system, scouting planets for any signs of life. A big part of the effort is Lt. Carolyn Palamas (Leslie Parrish), the ship’s anthropology and archeology officer, who Scotty has a thing for. Noting how late she’s been staying up working on this project, he smoothly asks her to join him for coffee. Kirk & McCoy rib him for this, with McCoy commenting that because Palamas is a woman, one day, she’ll find a husband and leave Starfleet…yeah, this is where you remember that Trek aired in the ’60s. While approaching Pollux IV, what looks to be a gigantic hand comes into view. Chekov wonders if he’s seeing things; “Not unless I’m seeing it, too,” Sulu responds. Regardless, the hand reaches out and grabs the ship. Confused, Kirk, McCoy, Scotty, Chekov and Palamas beam down to see a man sitting in a temple wearing ancient robes. 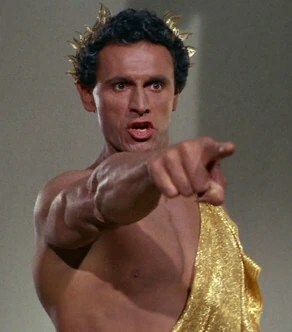 Kirk asks him how he knew about Pan and other names he mentioned, like Agamemnon, Odysseus and Hector. The man replies that he knew their fathers and their father’s fathers for he is Apollo. Apollo (Michael Forrest) is immediately smitten with Palamas and transmutes her uniform into a flowing pink dress. But is he really a god, and what does he want with the Enterprise? One of the main reasons Gene Roddenberry loved about The Next Generation was that, because that show aired in syndication, he didn’t have to deal with a network so he had more freedom; thus, TNG became the overtly-humanistic show it is. But this episode proves that the original series had that in it too. Several times, Kirk and the others assert that humanity has no need for gods, a development that ultimately ends on a very tragic note. It’s an interesting thread to follow, especially because, again, this aired in the ’60s, when, among other things, we had people longing to be like the ancient Greeks in terms of pastoral living. As to the rest of the episode, writer Gilbert Ralston turns in an interesting script that splits the bridge crew into two and offers interesting, suspenseful stakes on both sides. More than that, he manages to build the inter-crew relationships, which is always nice to see. Marc Daniels directs and while he’s not Joseph Pevney, he still manages to make the most use of the relatively few sets he has to work with. He also manages, in every scene with Apollo, to evoke the sword-and-sandal epics that were in vogue around this time period. The cast is terrific, as usual. The swapping out of Spock for others in the landing party kinda stinks, but everyone gets some good lines, particularly Chekov. Forrest takes a role that could easily have been hammy–and was apparently supposed to be originally played by Jon Voight–and imbues it with a surprising amount of pathos, particularly in his final moments onscreen. This is another strong episode that shows us how well this crew can work together and feels like a forerunner of several other examples of Trek. Recommended. Okay, well, that didn’t go as I planned. If you came to this blog on Saturday, you’ll notice that instead of Star Trek Saturdays, I instead announced that I would be liveblogging as I attended Youmacon in Detroit, MI. Well, what I failed to realize was that Youmacon, which I attended with my friends on behalf of my college’s anime club, is an absolutely massive event. Easily the biggest con I’ve ever been to, it dominated every inch of the two buildings it was located in, the Cobo Center (where most of the events were held) and the Renaissance Center, attached to the Marriott Renaissance that we stayed at. Just being in and among everybody was so all-consuming that to take time out to blog about it all would have been impossible. We left in two groups, with my car leaving Grand Rapids around 10-ish and arriving close to 1 P.M. After registering and receiving my 3-day pass, I dropped off my stuff at the hotel, then we all walked over to the Cobo center, where we split up to do our own thing. Not really knowing where to go, given that the con’s organizers only put up the events schedule about a week before, I decided to attend a 2-hour panel on Adventure Time, a show I came to love enormously this past spring and over the summer. Everyone else there loved it too, and the woman running the panel–whose name, if she said it, escapes me–seized on that. After a brief powerpoint with her thoughts on the characters and how the show, in her opinion, really isn’t for kids, and a short trivia session with free candy thrown–literally–at the correct guesser, there was a…well, “voice matching” contest is the best way I can describe it. It went like this: a clip showcasing a particular character was played–like, say, this one–and four audience volunteers went up and tried to imitate the character as best they could, with the best one winning a prize. I won twice, once for playing the Ice King–for which I won a giant lollipop–and once for playing Lumpy Space Princess, which after a tense standoff, resulted in me winning a can of beans (it’s something that makes sense once you research it). After that, and after some delightful conversation with a person I met there, I ran over to the Dealers’ Room basically just to look around and wound up, regrettably, eating from the food vendors in there, which of course charged an arm and a leg. Then, me and another member of our group went to the 7:00 panel hosted by Martin “littlekuriboh” Bellamy, creator of Yu-Gi-Oh The Abridged Series and the godfather of the abridged series/anime parody movement on YouTube. It was an enormously fun hour, which culminated with him previewing the latest episode of the abridged series of Yu-Gi-Oh Capsule Monsters. While I don’t want to go into full detail here, suffice it to say, the way the line was organized was an absolute mess; both ends thought they were where the line started and the stuff kept shuffling everyone around awkwardly for no real purpose. That was a mess, and consequently, the panel proper started about 20 minutes after its allotted start, but it was still hilarious. The whole crew–over 10 people, I think–were there, and were all equally engaging and entertaining. After that, we went back to the hotel room and hung out for a little bit. Then my one friend and I decided to go to one of the round-the-clock screening rooms at the Renaissance Center as they were going to be screening Attack On Titan, which is this year’s version of “anime that everyone flocks to and yells at you for not watching.” After accidentally getting in line for another panel, we found our way to the right room….where they were showing Pokemon. Yeah. Supposedly Funimation, which holds the rights to Titan and basically every anime ever, didn’t get the screening rights cleared in time. So that was irritating; after watching half of the first episode of the live-action adaptation of something else, we went to bed. Saturday was the first full day for us, and it was the most exciting for me, as I got to attend a panel hosted by, and later got to meet, Internet celebrity–and one of my personal heroes–Lewis “Linkara” Lovhaug, host of the comic book review show Atop The Fourth Wall. This year is the 5th anniversary of the show, which is one of the highlights of Internet review shows in my opinion, and the panel was a load of fun, with trivia, Q&A and fascinating stories from Lovhaug (turns out, he used to write Sailor Moon fanfiction). And after a two-hour wait in line, as he was next to Team Four Star, I got to shake his hand and thank him for his inspiration, purchase and get his autograph on the show’s official DVD, and actually talk to him for a couple of minutes about his cameo in Shortpacked! and about DC Comics. So yeah, that pretty much made my day. Lovhaug is a prime example of how to turn a passion into a career and meeting him was a joy and treasure. The rest of Saturday was still a lot of fun and laughs, but that was a highlight. I could go on, and I will post pictures soon, but in the end, Youmacon was a great three days and worth every penny I paid to get there.